There are questions for the Berkshire Museum regarding its stated financial crisis leading to the sale of 40 paintings from the collection for endowment and renovation. This is of great concern as it is in clear violation of ethical guidelines for deaccessions as stated by the Association of American Museum Directors and other professional organizations. The Federal tax information Form 990 for 2015 (obtained as a public document through Guidestar) showed total revenue of $4,258,774 and Net Income of $1,171,486. That compares with the claims made of losing over a million dollars a year in “structural annual deficit.” This demands an explanation that is clear as to what are the various items of income and expense and how are they being categorized. If the BM wishes to have any credibility in this community, they must release their full annual audited financial statements with footnotes. Contributions of $3,020,154. Does that include ticket sales? Membership income? Restricted gifts? Net fundraising income of $71,971. How is that figure derived? Does that mean that they had total fundraising of a larger figure, and the net of funds raised was only $71,971? What was the expense to obtain that net figure? For example, did they raise $300,000 and had expenses of fundraising of about $228,000? Sales of assets were $535,666. What was sold? Was it art? And were the proceeds allocated for art acquisitions as required by art museum association standards? Net inventory sales of $54,516. What was sold? And what were the expenses associated with those sales and where are they reflected in the figures? Total assets of $29,639,431 with total liabilities (which would include current obligations such as salaries owing and normal vendor amounts owed and not yet due) of only $2,242,493, and Net Assets of $18,396,938---does not look like an institution going bankrupt! And these figures certainly do not include the values of the millions of dollars of art they want to sell! The Berkshire community deserves an explanation of how the board calculates a structural deficit! Until and unless the full financial statements, including current ones, are released for review, as demanded by a Berkshire Eagle editorial, there will be good reason to question the judgment of the board of directors. Excerpt of Berkshire Eagle Editorial. Until these questions are answered, many people may conclude that the museum trustees and director and their PR people are misleading the public into believing it is necessary to sell the cream of the art collection of the Berkshire Museum. Perhaps they could figure out how to imaginatively use the art in programming to increase attendance. Consideration could also be given to obtaining revenue from loans or other use of the art, as other museums have done, that would also increase recognition of the quality of the Berkshire Museum's great art collection. 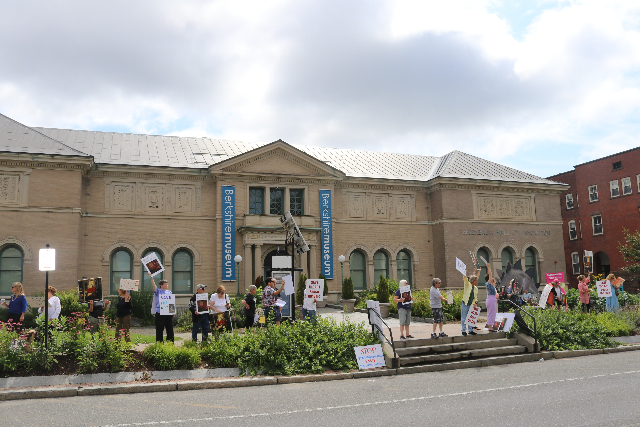 It is of great concern to watch the current trustees destroy the reputation and historical commitment of the Berkshire Museum by selling the major works of art that are so relevant to our Berkshire community. "Please note the assets are made up almost entirely of a buildings. Would you like to see the museum sell the building and leave the art to rot in the rain and snow. Then we wouldn't even have a science and history museum for our children. Also, note that a lot of misleading and inaccurate conclusions have been made from these 990 filings. 990s are part of a history history and contain information about financial health. They shouldn't be used for forecasting. JONAS: , the fundraising staff at the museum are awesome expert fundraisers. I have never seen a group of people work so tirelessly to keep an organization that serves our community alive and functioning. You belittle the work of all those who donate and raise funds in our community when you make a misleading and inaccurate comment like that." "Here are some questions: Where is the original Museum Charter or Organizing Document, Original Mission Statement, Trustee Agreements-guidelines, Museum Policy Guideline for Deaccessioning, and Agreement for being a Smithsonain Affiliate. What did the museum agree to as a member of the Association of Children's Museums, and as a member of the Institute of Museum and Library Services (which I read involves federal funding). Will the museum lose these affiliations now? Where are the documents that accompanied the "gifting" of the pieces being sold? Did Norman Rockwell say his paintings were for the People of Pittsfield as has been written? If so, can the museum be stopped from selling them? Maybe they should be placed somewhere else in the city if the museum does not value them. That way the people of Pittsfield will still have them as the artist intended. Can anything be done to halt the sale? Will a court intervene? The people of Pittsfield should come out in droves to protest the sale of these works! The museum should have been exhibiting and promoting itself better if it had so many wonderful treasures! I read that the museum sold four paintings in 2008 for about 7M that it never displayed! Is that good management? What was that money used for? Will there be more sales until there is no more art left? Maybe instead of getting rid of the art the people of Pittsfield should get rid of the people running the museum! Get all new people in there! And bring out the art and put it on display! Who knew it was there? I guess they wanted to keep it a secret!!!" "I am horrified that so much of the very best of the Museum's collections is being sacrificed. One would expect a sell off of much lesser works in order to raise funds for either operating expenses or future up grades to the collection; much less the funding of a soon to go out of fashion architectural fad, inspired by completely faulty presumptions. The only analogy to put this dumping into perspective would be to imagine the Louvre selling off the Mona Lisa to pay for I.M. Pei's renovation, and architectural excrescences. The implacable intractable malice of the Museum's post-Orwellian posturings, complete with all the weaponized buzz words targeting a population that is obviously clueless to what is going on, makes one wonder exactly what really is at stake in this gambit; considering all the skullduggery that permeates the glorified horse trading that is the hyper-commodified art world. Sotheby's putting the works on display at their venues has a rather sardonic twist. The pre-sale viewings are standard operating procedure, serving Sothehby's own interests. The extreme dumbing down of practically everything (including museums) in the past 50 years. Old Miss Palmer who ran the Childrens' Activities room at the Museum was worth more that 10 Innovation Halls put together. In the 1950s, the level of intellectual awareness and discourse among blue collar workers and even menials, in Pittsfield, was considerably higher than one encounters among most "professionals" of the present day. If the Berkshire Museum tried to dump the same "blue chip" items back then, it would have found itself besieged by angry mobs made up of every level of society; from those sweeping streets and collecting garbage to members of the Crane and Eaton families...with a very good chance of the Museum's administrators being tarred and feathered and run out of Town on rails." "Good sleuthing, Charles. Beware, Donald Banana! You're next." "It looks like Van Shields stopped raising money over the last two years. Was that to make the case for the museum not being able to sustain itself more convincing? If so, he's a more serious manipulator than it appears. And less admirable, if he ever was."